Welcome to our roundup of the best small barbecues and portable barbecues around (or 'BBQs' if you're illiterate). Summer is here (more or less) so just shove them in the boot of your car, head somewhere picturesque, and cook as nature intended. What is the best portable barbecue? Everdure 'by' Heston Blumenthal has disrupted the barbecue market to highly impressive effect in recent years. For the not inconsiderable feat of making what is essentially a metal box that you put charcoal in stylish, the Everdure Cube is our #1 pick. But don't rule out the excellent new gas-fired Primus Kuchoma, our top choice for campers and boaters. Anyone with an interest in barbecues will probably not be surprised to see that we're also big fans of the Weber Q W1200. Weber is the world's number one for a reason and its grills are a very, very safe choice. But there are plenty of other great options here and whichever you choose, they're all leagues ahead of a disposable aluminium tray that you pick up by the entrance to the supermarket. First of all you'll need to decide if you want to use charcoal or gas. This makes a difference in terms of flavour, as gas doesn't create the smoky flavours that you only get with charcoal and wood. Gas certainly has its place in terms of consistency and convenience when cooking outside, but it does also reduce the authenticity of the results. Secondly, you need to look out for the grill size with these portable units - as well as how much they weigh if you really are after something you can carry down to the beach. Equally, you don't want something you can carry, but you can't cook what needs to be cooked - especially if it means you need to do two or three batches of cooking. That's no fun. There are different methods of cooking on a barbecue. Without a lid is known as grilling or direct cooking. Ben Tish, Chef Director of the Salt Yard Group, gives his verdict on that age old question - what's best? Charcoal or briquettes? "Lump wood charcoal is superior in flavour to briquettes due to the fact there aren't any chemicals or binders in there to mask or skew the flavours. "Most charcoal is from South Africa and will have been compressed so it travels better and doesn't break up in transit. I'd suggest British charcoal which is much lighter and burns better. Apple, hazel and oak all have their differing flavour qualities." This eminently portable charcoal burner doesn’t sport any groundbreaking technological features because it is, to all intents and purposes, just a square container with a shallow charcoal tray and a steel grill on top. The firmly secured lid, too, is a clever design flourish since it encompasses both a sealed plastic storage tray with room for a few cuts of meat and a bamboo food prep board. 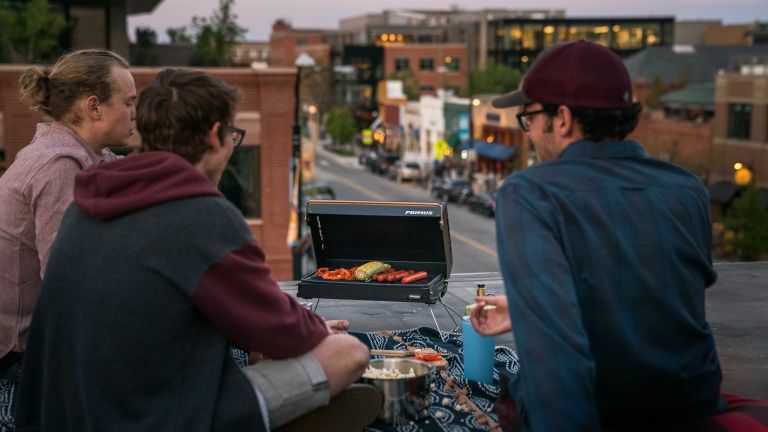 This new gas-fired portable barbie from outdoor experts Primus is a perfect cooking companion for campers, boaters and picnic fiends, and a handy table-top griller for balcony use, too. Despite the very slim legs, the compact Kuchoma is exceedingly well built and runs off both mini camping gas canisters or large Patio Gas cylinders (with optional adaptor). It also comes with an integral hinged lid – with carry handle – for either direct or indirect cooking; a very good thing indeed. The Kuchoma’s non-stick 40cm x 24cm grate will comfortably accommodate about 20 sausages or a dozen chicken legs – enough cooking estate for a cult of campers – and, at 4.5kgs, it’s light enough to carry a fair old distance without your arm falling off. Highly recommended. Most professional chefs will choose charcoal over gas but sometimes gas is better, like on a campsite, the local park or perhaps the deck of your yacht. This portable model uses small, easily acquired, disposable camping gas-type cartridges and features a porcelain-enamelled, cast-iron cooking grate big enough for six or more placements, a tall aluminium lid with built-in thermometer, two fold-out side tables and push-button Piezo ignition. On-trend bonus: it comes in a range of cool colours including orange, fuschia, green, blue and purple. Going on a picnic? You need this natty barbie-in-a-case. Picture the scene… You arrive at the riverside looking for all the world like a businessman who's just stepped off the plane, stoop down and open your briefcase to reveal a fully functioning barbecue replete with charcoal tray and stainless steel 16x25cm grill. Only one problem: you forgot the charcoal. But assuming you do remember to bring the fire-making essentials, this is a nifty little thing and more than worth the low price. Forget faffing about with hairdryers to fan the flames. This award-winning barbie uses a built-in battery-powered fan to get the whole thing up to cooking temperature in three and a half minutes flat, and with no choking smoke in the process. What's more, it'll go on grilling for up to an hour on only a small handful of charcoal. LotusGrill works by creating a bellows effect that forces cool air over the charcoal, turning it into a raging inferno, albeit a safe one. Available in seven cheerful colours and is ideal for small patios, balconies, campsites, picnics and boats, its 32cm grill is good for up to four hungry gannets. There's also an £89 Fondue Grill Accessory Kit for it, letting you rustle up delicious, 1970s, continental-style cheese-based meals. Delicieux! This gorgeous powdered blue gas portable comes with two Piezo-operated, jet-fired burners, a clearly labelled lid-mounted thermometer, a pair of fold-out legs for table-top or camp floor use and enough cooking space on its cast iron wavey grill to handle up to 18 hamburgers. It runs on easily-obtainable disposable screw-thread gas canisters (think Camping Gaz, Coleman, etc) though, with the addition of a longer hose, it can apparently also be adapted for large Patio Gas canisters. Like the similarly styled Weber Q 1200, the TravelQ grills meats and fish exceptionally well and the heat is easily controlled when flare-ups occur. This barbie’s perfect for camping trips in the car or caravan and ideal for balconies and small patios. Just don’t entertain the idea of lugging it across a field for a picnic, because it’s way too heavy for that. This is one of the most versatile charcoal-fired mini barbecues on the market and one of the most efficient. Invented in South Africa, the sturdy, kettle-style Compact Cobb is a small, portable cylindrical unit that can grill, fry, bake and even roast a whole chicken, albeit a small one. Its secret lies in a controlled ventilation system that keeps the briquettes (or Cobb's own proprietary Cobblestones) up to fiery temperature for more than three hours and without any heat being transferred to the BBQ's outer casing. This particular model comes packaged with an overly slippery Teflon-coated griddle – whoops there goes another sausage – but there are plenty more grilling accessories available. A top buy for alfresco feasters, boaters and glampers. Ageing lad-chef Jamie Oliver has applied his culinary knowledge to an own-brand portable that sports quite a few unique design features, including a curved grill tray that prevents food from slipping into the inferno, a removable charcoal container, adjustable air vents, grippy lid locks for easy transport and a chunky rubberised lid handle that won’t scorch your hand when you grab hold of it. The Adventurer is a doddle to control (simply use the long lever to open or close the air intake vents), large enough to accommodate about 16 sausages, and light enough to carry to a beach, campsite or picnic spot of your choice (as long as it's not too far a walk). It’s also perfect for small patios or as a second standby barbecue. Table-top grilling has two main bonuses: it’s more enjoyable grilling one’s own cuts and it’s much more sociable, especially for the bloke in the household who usually has to stand alone for 90 minutes in front of a blazing inferno while wrestling with exploding sausages and a mushy fish that’s fallen through the grate. This elegant two- to four-person patio barbie uses just a simple charcoal tray, a 26cm stainless steel grill and a cup of water to save the table from scorching, so you couldn't exactly call the Barbecook Joya sophisticated, but it cooks food perfectly well. The Joya's attractive white ceramic base remains cool to the touch while guests slap on their own kebabs and sliced steak using the supplied bamboo tongs. A preloaded handful of charcoal gets you started. And now for the smallest, most portable grill in the world. This barbie in a stainless steel tube is just the ticket for the picnicker, beach bum, hiker, climber, Bear Grylls wannabe or anyone with very little room in the backpack. To build it, simply empty the tube of its contents – 12 stainless steel struts, four short legs and a second, slightly narrower steel tube – thread each strut through both tubes and then attach the legs. Now place it on a non flammable surface and stuff some wood or charcoal under it and, voila, instant campfire barbecue. The Grilliput’s is available in two sizes: the Duo serves two-to-three gannets and the larger Quattro will handle up to six. Once it’s cooled down, disassemble it and you’re good to pack up and go.